I’ve been using Google Music to listen to and store all my music for a while now. The reason I’ve been using it is obvious, i.e. it’s well integrated with all my Android devices; of which I have four. It’s fairly easy to use. 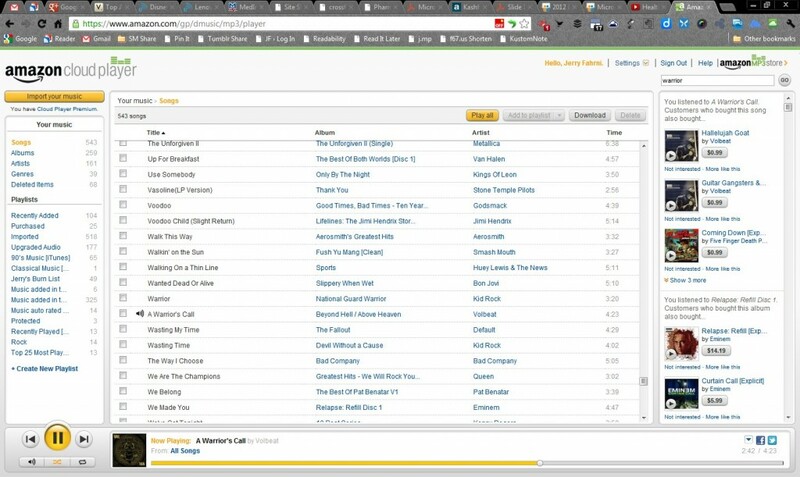 I dump music on any of my computers and Google kindly syncs it to my other devices in addition to the cloud. It offers all the essentials including offline listening, which I use while traveling. Prior to Google Music I was using Amazon’s Cloud Player. It was fine, but Google Music made more sense to me at the time. Recently my Amazon Cloud Player subscription came up for renewal. I thought about letting it go, but the deal Amazon was offering was really good. For $25 a year I get unlimited music storage plus 50GB of Amazon Cloud storage. I couldn’t pass. I’ve been using the Amazon Cloud Player for about a week and I must say, I think it’s better than Google Music. The UI makes more sense to my brain. The layout is more intuitive; less shiny, but definitely more user friendly. Music that I import into Amazon Cloud Player is automatically upgrades to high-quality 256 Kbps audio when possible (if Amazon has the rights to that particular song). Music that is upgraded shows up in an “Upgraded Audio” playlist. I had 177 songs that were automatically upgraded. Cool. Amazon Cloud Player offers the ability to manually edit song information including artist, album, album art, song title, composer, disc number, song number, genre, release year, duration, and bit rate. Or if you’re lazy like me you have the option to import the information associated with your music directly from Amazon’s catalog. I’ve found a few songs that Amazon couldn’t find information on, but not many. Amazon Cloud Player has a panel running down the right side of the screen that shows recommendations based on my music selections. It’s not bad. I’ve found a couple of things worth investigating. Even made one purchase based on those recommendations. Ah, the power of persuasive advertising. What can I say? I’m a sucker. Will I give up on Google Music? I don’t have to. It’s free and it keeps track of all my music in addition to being available from any machine at any time. No, for now I’m just planning to use Amazon Cloud Player until I grow tired of it and move on.